DD Dragon English Schools are well known private English schools in China for children to attend after their daily Chinese schools. Children ranging from 4-14 can come to our schools in the evenings and on the weekend to learn English and have a great time doing so. This franchise has done very well since its opening and continues to grow. Here in Hangzhou we opened the original school in 2006. Due to our success we have opened a second school in 2012 next to the original school. We are located north of West Lake in an area ripe with schools, malls, restaurants, bars, and a large sports complex. This has helped us to continually grow. However with lots of competition we have worked hard to be better than the rest. As a franchise of DD Dragon we still use some successful tools and styles that have been the staple of DD Dragon. However we have also striven to continue to change with the times and have instituted many of our own unique ways of doing things and added cutting edge teaching materials to create a better learning experience for our students. Our schools are designed to create a fun and sporty atmosphere. The rooms are lined with benches so that we can create a more active learning experience for children, allowing them to often get up to run around and play games without the worry of moving desks and chairs. There is also a very large Smart Board in each room that allows teachers to create great lessons using our smart book programs, and the endless materials online. We also have a large array of toys (balls, pins, dart boards, basketball hoops, cards, dominoes, marbles, flags...) for teachers to use in preparing fun and effective lessons. The floors of each classroom have taped lines like a school gymnasium to facilitate playing different types of games and teaching drills. Classrooms that have young students also can use our smart TV's for endless songs, videos and games to keep students attentive and enthusiastic. Each Classroom also has a large white board to help with the organizing of lessons. Classrooms also have large windows for parents to observe the activities from time to time and to see the fun. Our staff includes foreign teachers that have come from countries such as Australia, Canada, New Zealand, South Africa and the United States. There is also a large Chinese staff of teachers. Each classroom is staffed with a foreign teacher and Chinese teaching assistant, or TA. The TA helps prepare the lessons and control the class in case of language barriers between the foreign teacher and children. 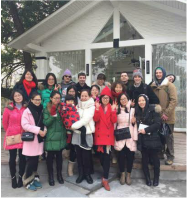 Our TA’s consist of Chinese girls from all over China that have graduated from college and are looking to further their English teaching careers, or just enjoy the opportunity to work with children and foreigners. Our entire staff is a very close knit group because of the close proximity of the two schools. We are a passionate and hardworking group, that also have fun and enjoy what we do. Our classes run from 5:00 PM to 8:10 PM Tuesday through Friday. On Saturday and Sunday we run from 9:00 AM to 12:10 PM (Lunch Break), and then from 2:40PM-6:00 PM. Mondays are technically the only day off, but with such a light class load Tuesday through Friday, it is a very relaxed work schedule. Each class runs 90 minutes. This allows two classes each week day and 4 classes on each weekend day. Each class period will run for about 50 minutes, with a 10 minute break, followed by 30 minutes for a full 90 minute class. Classes will have a maximum of 14 children, but the average has been 10 per class. The ages of the students start from 4 years old up to around 14. The majority of classes are for young children starting at one of two levels. There is a younger level for children aged 4-8 that has a simple curriculum, DVD’s and fun homework. The second program focuses on learning English at the age of 8. This curriculum is more intense and progressive allowing children to learn grammar, everyday topics, read, write, and create a large vocabulary base. No matter what age or level of English, each class is still presented in a way for children to have a fun, active, and effective learning experience. Teaching plans are very organized and created by the teaching assistants every week. The progressive books and teaching plans make the lessons easy to understand and to follow; only minor changes are made by the teaching assistant to help with the specific needs of each class. The job of the Teacher is to create a fun and effective way to present the lesson to each individual class. As each class is different in personality and age, it is the teacher’s responsibility to come in every week with new games, drills, and teaching styles for the different classes and put them into action. Each week a teacher will have the same class twice and implement the games, drills or techniques, and then the following week come up with a new set of games, drills and techniques. With this format each class gets to enjoy a new set of games and drills each week and look forward to new fun and challenges the following week. This motivates both children and teachers to be excited and interested each and every week. The goals of this institution are to be the best in our niche of teaching English while also creating an amazing place to work for both the Chinese and foreign staff. We hope to continue to grow and have both schools filled to capacity without losing the great quality of teaching and fun learning environment. As large schools lose the personal touch and quality that comes with great numbers, it is the hope of this organization to never lose that ability. We will continue to strive to create better techniques of learning for children, using the most up to date tools, while keeping the great work atmosphere that only comes with a small quality English institution.